This quilt has been abandoned since the start of school in 2012. Yes, 2012! The start of school seems to encourage UFOs. The pattern is Bonnie Hunter's Crabapple from her first Adventures in Leader's and Enders book. Mine is mostly red though, so I am calling it Cherry Blossoms. Yesterday it was time to pull it out again and finish it up as I ponder whether or not to start a new project. 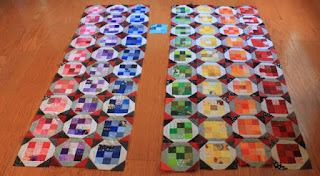 When I grabbed the container from the closet, there were 12 finished blocks and plenty of nine patches for the rest. 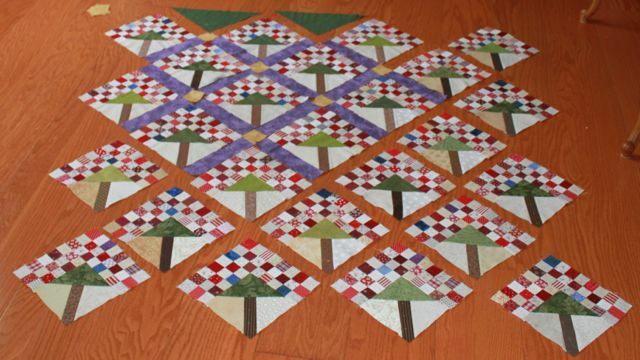 This morning I finished up the paper pieced tree bases and added the tops. It didn't take very long at all. Whenever I pull out an abandoned project, I am always amazed at how quickly an unloved box of bits and pieces can turn into a quilt. 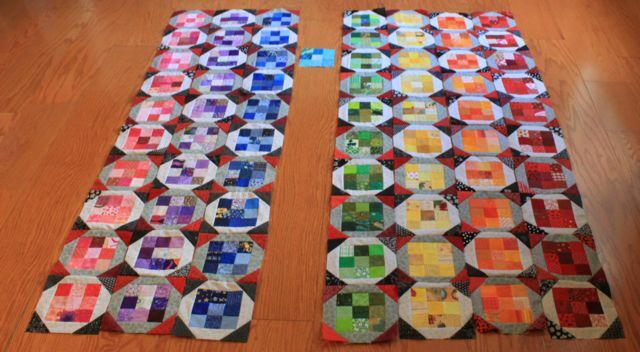 So now that the 25 blocks are done, it shouldn't take long to cut out some more sashing strips and cornerstones. I hope to use up the rest of the nine patches in the border. After that I can decide what is next. 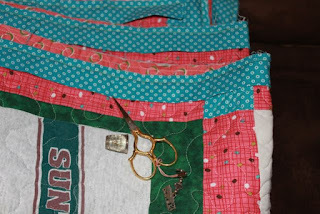 In honor of this very scrappy project, I am going to link up with Quilting is More Fun than Housework for Oh Scrap. Go check it out for more scrappy Sunday fun. The color for October is brown. 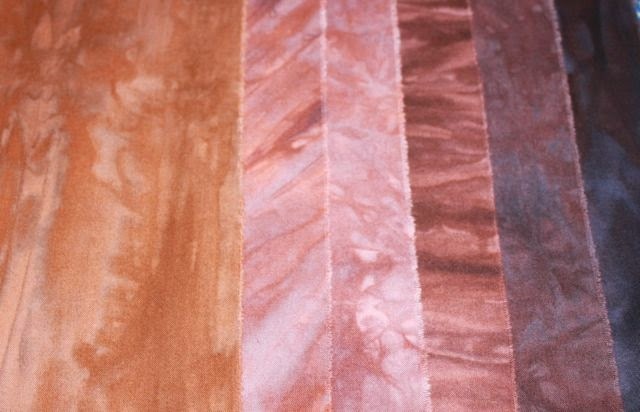 I know a lot of people are hesitant to include darker hues in a rainbow quilt, but I encourage you to give it a try. Why not play with ALL of your scraps? Dig out everything from the paper brown beige lurking in the background pile to the almost black that will really give your brown blocks some depth and variety. They are all just scraps after all, what it the worst that could happen? I'm hanging out at home with Sydney ready to sew some binding. 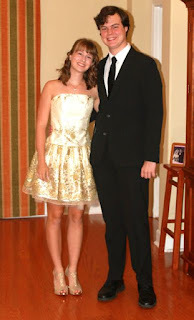 Anna is off to the homecoming dance with River. Ryan is going too, with a group of friends. I was puttering around pondering whether or not to start a new project. A Farmer's Wife quilt along is going to start on Tuesday. I was thinking about joining in, but my book is the original Farmer's Wife quilt, and not the 1930s version. Still, I picked a few simple four patch blocks to play with this morning. For now I'll sew some binding and keep pondering. 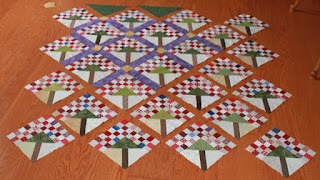 My big news this weekend is that I have finished the Sawtooth Sampler Blocks! I was on a role last Sunday and powered through the last four blocks. Still feeling strong I puttered around a bit more until the rest of the alternate blocks were on the wall too. That will leave me free today to play with the last of my orange scraps. Next Saturday will start a new color! I hope your orange blocks are coming together nicely. Misterlinky is below so that we can all come and visit your progress. 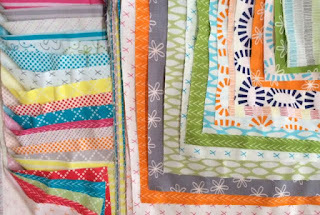 The orange alternate blocks form a big zig-zag all the way across the quilt. To accomplish this, you will need 42 2.5 inch squares in orange as well as 28 2.5 inch squares of background fabric. Add to this collection 13 4.5 inch squares of background fabric and you will be ready to roll. Start with the 2.5 inch squares. 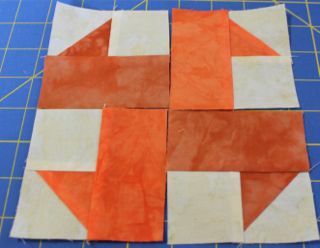 Use 28 of the orange squares together with the 28 small background squares to make 28 two patches. Combine these together to make 14 four patches. 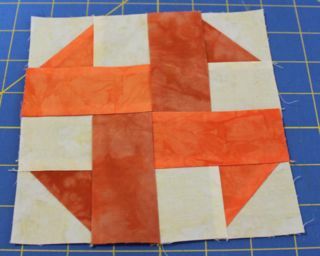 The remaining 14 orange squares will be sewn together to make two patches which will become part of the block centers. Now the orange four patches can be combined with the larger background squares to make the top or bottom third of each block. The orange two patches can be combined with the yellow two patches above and the red or pink four patches below. Because the yellow, red and pink blocks have already been made, you are ready to put the entire orange row together. The center two alternate blocks are orange on the top half and red on the bottom. The two outer edge blocks are orange on the top and pink on the bottom. I'm feeling a whirling theme this year. 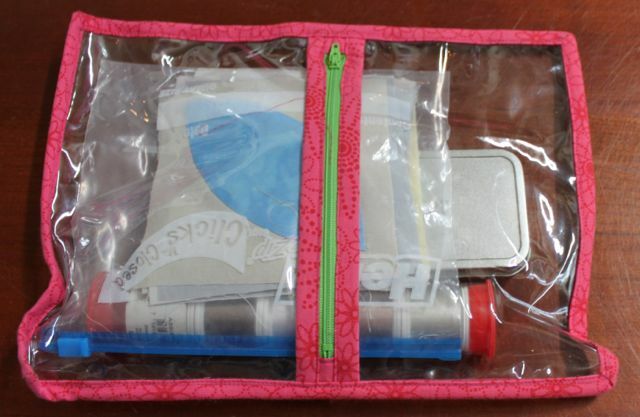 I saw this one on Modern Diary as a mini quilt. You will need 1.5 inch strips in orange and background. I chose two oranges, but you could use one or more. The smaller blade is only slightly tricky to cut. Taking your 1.5 inch strips, line up the easy angle ruler with the strip centered between the 1 inch and 2.5 inch lines. You will need four of these shapes. 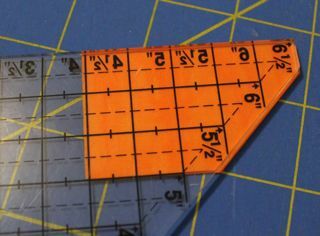 To make the piecing easier, go ahead and trim the dog ears using the other end of the ruler. Repeat the entire process to cut 4 of the same shapes out of background. My fabrics are the same on both sides, but if they are not, make sure you do a mirror image. 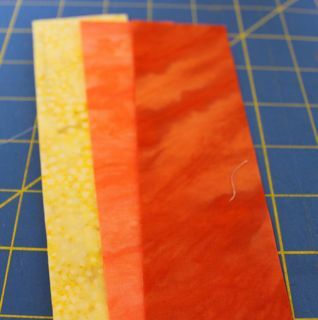 In addition to the center strip pieces, you will also need 4 each of 3.5 by 1.5 inch strips in background and in orange. 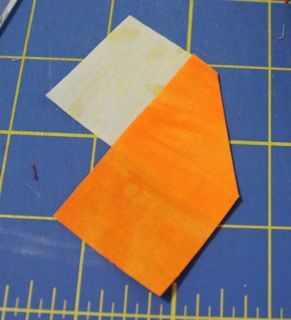 To piece the center strips, sew the orange and background pieces together along the hypotenuse. Repeat for all four sections. 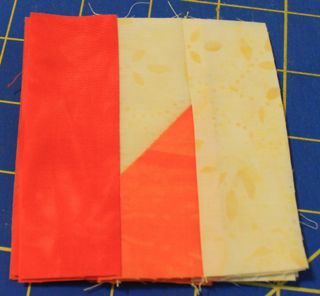 Press toward the orange fabric and you should have a rectangle which is also 1.5 by 3.5 inches. 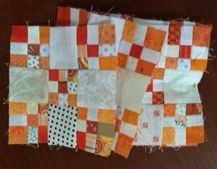 Sew all three strips together with the long orange side of the center strip facing right so that it makes a little step up. Press both sides away from the center section. Repeat for all four sections. Your subunit should measure 3.5 inches. The four sections should be put together so that the orange sections rotate from the left. Check out the picture to be sure everything is facing the right way. Here is your finished 6.5 inch sampler block. 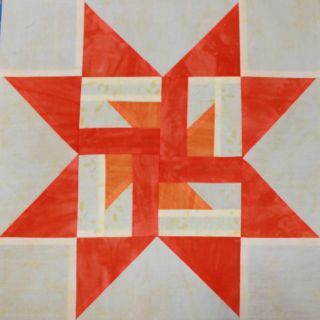 Add your star points to the finished sampler and you are done with the Sawtooth blocks for September. Stay tuned for the alternate blocks. 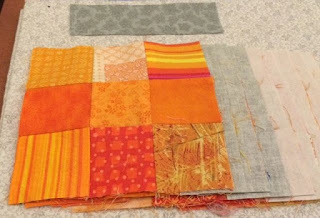 I was trying to decide what to call this quilt and I was finishing up the orange and yellow blocks. Framed Nine Patch isn't exactly catchy. So combining the nine patches with the diamond corners, I'm thinking about 9 Carat Diamonds. I also realized while tidying up, that I hadn't used any teal nine patches. 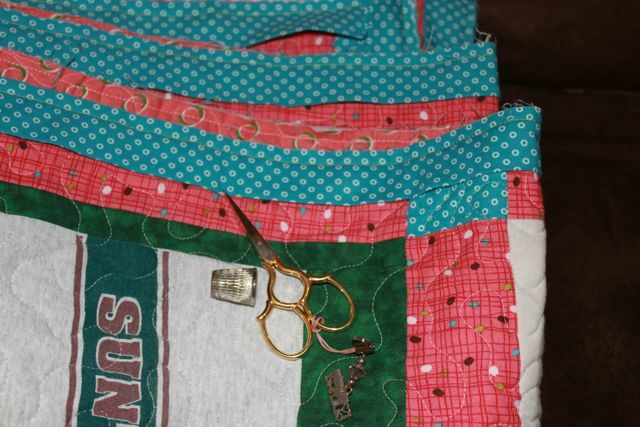 So teal will be the one last row and this quilt will be ready to sew together. Not quite yet though. Anna has lacrosse games at 1 and 2 and Sydney has hers at 2 and 4. So I'll be off at LAX under an umbrella stitching away at some orange peels between games. Hope you find some time for hand sewing on this day of rest. Kathy is hosting her Sunday link-up if you'd like to check out other slow stitching project. 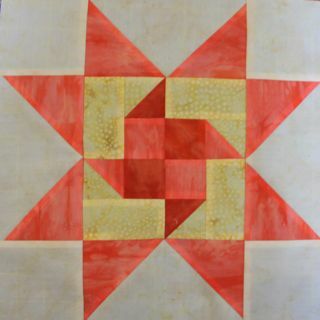 I am hoping to add a row of orange to my framed nine patch quilt today. 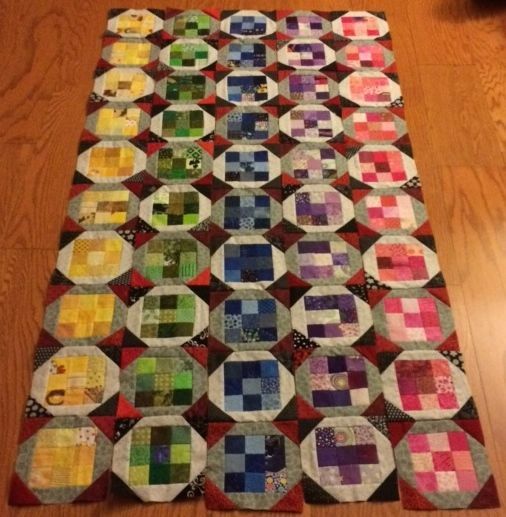 It is going to be a vertical quilt, so I think it will need 8 columns to go with the 10 blocks. Orange and red will bring me up to 7. Then I am thinking white or brown for the last set. I still have lots of nine patches left over, so orange and red are ready to go. It shouldn't take long to frame them out. First though, I'm heading up to our 114 acre study sight. We got the news on Monday that we have permission to begin our camera trap project. Now we just need to figure out all of the details. There is play practice as well and a football game in the evening. Lots of good weekend fun to look forward to, but not so much that I won't be able to find some time to enjoy the sewing room. 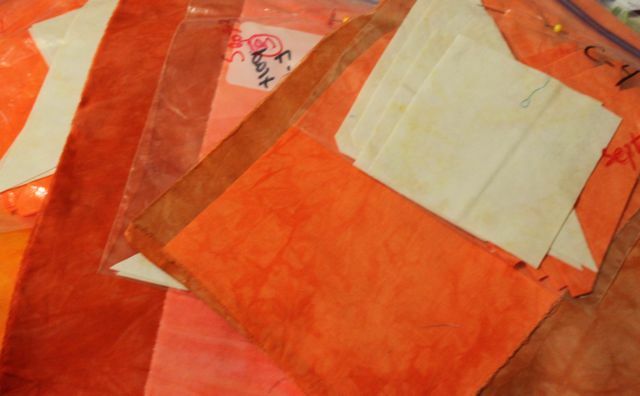 Speaking of enjoyment, I haven't yet had the drawing for Vicki Welsh's package of hand dyed orange fabric for this month. Please leave a comment on this post to enter the drawing. I choose a random winner later this week. I hope that fabric and thread will be a part of your weekend as well. Misterlinky is below so that we can all come by and enjoy your progress on the rainbow scrap challenge. Another whirling block built on 2 inch strips. Find 2 inch strips of background and two different oranges. You will need half square triangles in both of the oranges. 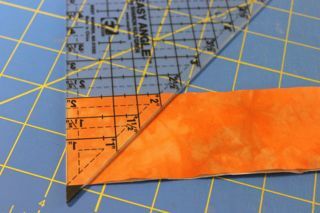 Layer the orange right sides together with the background and use the easy angle ruler to cut 2 HST units from each orange. 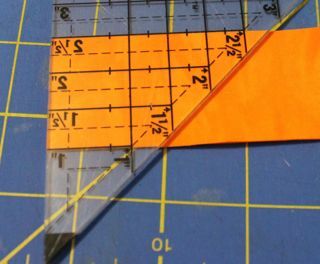 In addition the these 4 HST units you will also need 4 3.5 by 2 inch rectangles in background as well as 2 two inch squares in each orange. Sew the HST units together, trim the dog ears, and press toward the dark. 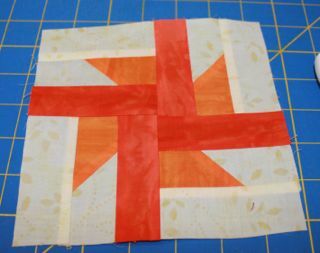 Next, sew a HST onto the top of each orange square. Mix up both oranges so that each subunit has both shades. 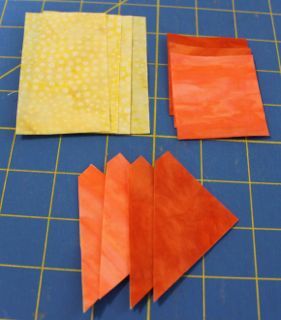 Press away from the diagonal seam and sew these pieces to the background rectangles so that the background fabrics face one another in the middle. 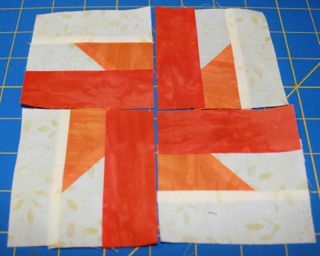 Take these four finished subunits and arrange them so the orange squares form a four patch in the center of the block with alternating shades. Here is your sampler block ready to be framed out by star points. 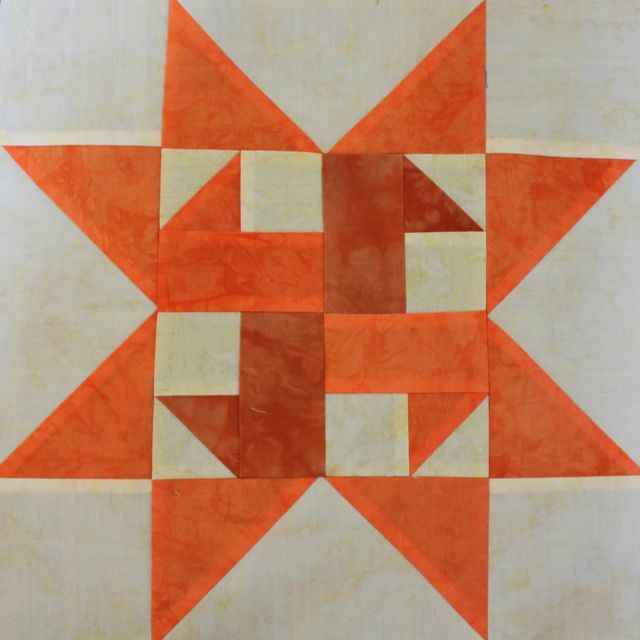 Adding the star points will bring your block up to its final size of 12.5 inches unfinished. I got new fabric in the mail yesterday. 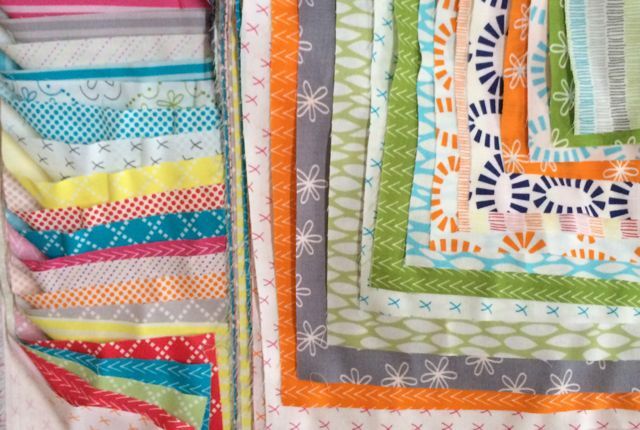 It is a fat quarter bundle of a new fabric line from Connecting Threads, designed by Amanda Jean from Crazy Mom Quilts. It is in the laundry now, because I am a pre-washer. Hopefully it will be ready to use this weekend. I can see a few oranges in there after all. 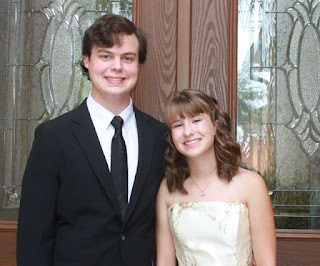 While searching through my photo stream, I kept finding pictures of the kids. 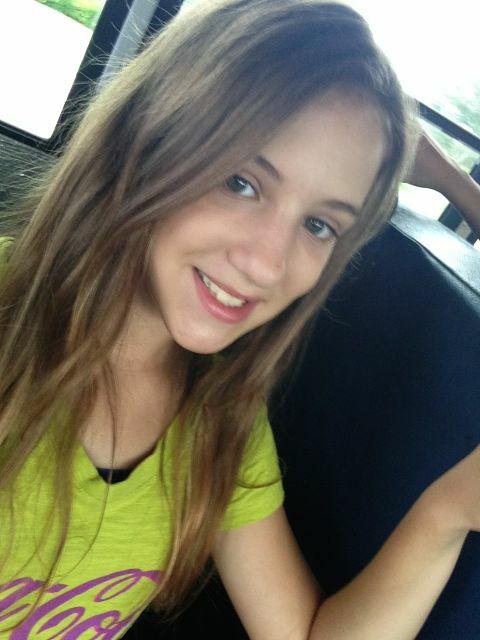 This is Sydney on the school bus. Here is Anna with her BF. I wonder if they realize that I see all of their photos? I finally found time and energy to start on my Rainbow Scrap Challenge Sampler blocks for September! This is a simple whirling block based on two inch strips. 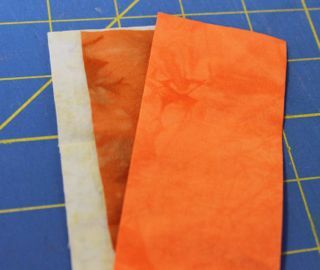 You will need two shades of orange and some background fabric. 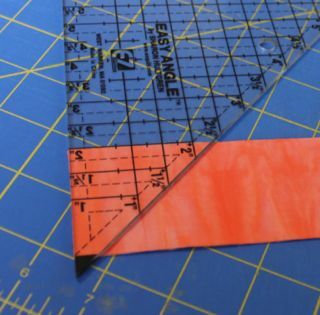 Start by matching one 2 inch orange strip with a background strip and use the easy angle ruler to cut two HST units. Repeat with the other orange. 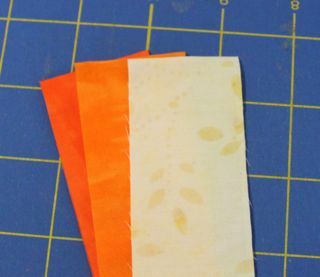 You could also use one orange or four different oranges depending on what scraps you have on hand. 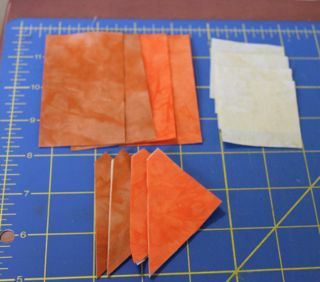 After preparing 4 HST units, you will need to cut 4 squares of background fabric and two rectangles of each orange 2 by 3.5 inches each. Sew the HST units together, remove dog ears and press. Match each HST so that the hypotenuse of the orange touches the square. 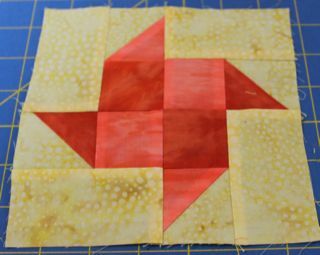 Sew the squares together and press away from the HST units. The two patch should now be the same size as your rectangles. Match them up so that the other hypotenuse of the orange touches the orange rectangle. 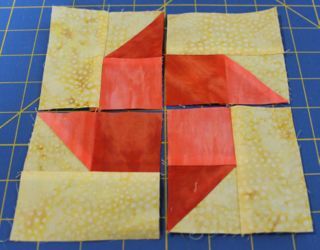 Sew each of these four pairs of rectangles together. Now you will have four subunits ready to arrange. Whirl them around the center point and sew the four patch. Here is your finished 6.5 inch block. Add star points to complete your sampler block. These are the fabrics for my orange star blocks all grouped and ready to sew. Normally by this time in the month all the blocks are made and scheduled to appear sporadically. Alas, this month is off to a slow start. Today should bring some much needed sewing time. Hopefully I will be awake for some of it. The last three days have been spent sleeping off a bad head cold. You know I'm not feeling well when I'd rather lie in bed streaming Netflix than get up and play with pretty fabric. Hopefully you have all gotten off to a better start on your orange projects though. 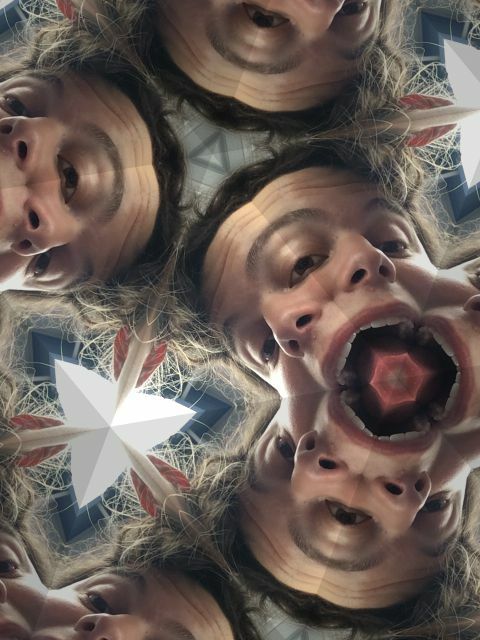 Misterlinky is available below for sharing all your orange posts. We were in Hilton Head this weekend to visit with family. After all the recent travel I wanted nothing more than to stay home, but it didn't quite work out that way. I was worried that it would be super crowded on the holiday weekend, but it didn't seem that way at all. We had a nice time visiting with Kurt's parent's and siblings. We each had our own condos, so there was an occasional break from the chaos. Most of the time though it was lots of good loud family fun. Many card games, a few trips to the beach and plenty of time to catch up on what everyone has been up to. After this it will be Thanksgiving before we will be able to see everyone again. I did take along my orange peels, but did not get many stitches taken. I think it was last weekend that I worked on my nine patches. It looks like there are 12 ready to go in orange. Slowly but surely this quilt will come together. As busy as it has been in the transition back to school I will remain grateful for whatever small snatches of sewing time I can steal away. Scraphappy Saturday - Orange you Glad it's September? For Thisbe of us in the US it is a three day weekend. An extra day to sew! School is just starting to slide into a regular routine. My AP Biology kids are hatching butterflies. 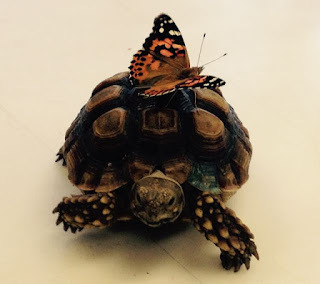 Actually we are accounting for the biomass and energy exchanges within an ecosystem, but it involves pretty butterflies. This one was hanging out on Shelldon's shell this morning while I was at a meeting. Anna took a picture for me. Yesterday I was hanging out with my 9th grade biology classes learning about organic chemistry when the phone rang. It was my assistant principal wanting to know what I was doing that day. So I said we were using play-doh to model lipids and she asked if she could drop by with a news crew. I thought she meant the one from our school announcements. Instead, she showed up with a crew from the Orlando WESH 2 news. They were doing a story about our school recently being rated as the best high school in the state. So I was on the news! My students were so excited! Go look, you can see me doing my teaching thing. Ryan is in there too, wearing an orange shirt and hanging out eating an apple with some girls at lunch. So no sewing lately, but lots of good stuff is keeping me busy instead, so I will be thankful and enjoy every day.